Complete the online account registration form and to enroll in a TRYOUT, CLASS, CAMP or CLINIC, click "Select Class". I, and the participant(s) understand the nature of this gym's activities and sponsored events and certify that the participant(s) is qualified, in good health, and in proper physical condition to participate in such activity. I acknowledge that if I or the participant(s) believe the event conditions are unsafe, he/she will immediately discontinue participation in the activity. I and the participant(s) fully understand that this activity involves risk of serious bodily injury, including permanent disability, paralysis and death, which may be caused by my own actions, inactions, those actions of others participating in the event, the conditions in which the event takes place, or the negligence of the "releases" named below; and there may be other risks either not known to me and/or participant(s) or not readily foreseeable at this time. I and the participant(s) fully accept and assume all such risk and responsibilities for losses, costs and damages I and or participant(s) incur as a result of my participating in the activity. I and participant(s) hereby, release, discharge, and covenant not to sue Cheer St. Louis, LLC, its respective administrators, directors, agents, officers, volunteers, employees , any sponsors, advertisers, owners and lessors of the premises on which the activity takes place, (each considered one of the "releases" herein) from liability of claims demands, losses or damages, on my account caused or alleged to be caused in whole or in part by negligence of the "releases" or otherwise, including negligent rescue operations. I and participant(s) future agree that if, despite this release, waiver or liability and assumption of risk, I participant(s) or anyone on my behalf, makes a claim against any of the releases, I and participant(s) will indemnify, save and hold harmless each of the releases from any loss, liability, damage or cost, which any may incur as the result of such claim. I and participant(s) have read the release and waiver of liability, assumption of risk and indemnity agreement, and understand that I and participant(s) have given up substantial rights by signing it and have signed it freely without any inducement or assurance of any nature and intend it to be a complete and unconditional release of all liability to the greater extent allowed by law and agree that if any portion of this agreement is held to be invalid, the balance, notwithstanding, shall continue in full force and effect. And I, as the minor's parent and/or legal guardian, understand the nature of the above referenced activities and the Minor's experience and capabilities and believe the minor to be qualified to participate in such activity. By registering with Cheer St. Louis, your credit card will NOT be charged. Upon enrollment in a Cheer St. Louis team, class or event your card will be charged for due tuition and annual membership registration fee. Fees will be charged on the designated due date or date of event, class, etc. LATE FEE: A $35 late fee will be added to decline auto pay accounts. ANNUAL MEMBERSHIP FEE: The Membership Fee is required to enroll in class. This fee is paid upon initial registration and each 12 months thereafter. Individual Membership is $40, additional siblings are $15 each. MONTHLY CLASS TUITION FEES: The class structure at Cheer St. Louis is designed to be a year round program. Our class tuition is set up on a monthly schedule based on an AVERAGE of 4 classes per month. If a month has 5 classes we do not increase tuition. If a month has 3 classes, we do not pro rate tuition. Make ups may be scheduled by contacting Cheer St. Louis and are subject to availability. Class fees will be prorated upon enrolling in classes. Annual registration fees and current months tuition is due before attending first class. Anyone attending class, unpaid will be automatically auto paid with the card on file. All drops from classes must be submitted in writing via email at frontdesk@cheerstlouis.com and are effective current month end. Class fees will NOT be prorated. All drops must be submitted, in writing, before the 1st day of the month to avoid tuition charge. Students must be active to schedule make ups and make up classes may only be scheduled 1 week at a time. NON-MONTHLY CLASS FEES: Tuition for non-monthly class fees will be charged upon enrollment in the class or event. 24 hour cancellation notice required for refund. No make ups. PRIVATE LESSON FEES: Private lessons will be automatically charged on the day of the lesson. Private lessons require 24 hour cancellation and are non refundable. In the event of a "no show" or lesson canceled without 24 hours notice, you are responsible for the fee in full. RETURNED CHECK FEE: In the event your check is returned NSF, there will be a $35 returned check fee in addition to the original amount. Your class spot is forfeited until full payment is received. Applicable late fees apply. TEAM FEES: Those enrolled in a Cheer St. Louis competitive or recreational team agree to the rules, policies and terms in the current tryout packet. PHOTO RELEASE: I am aware that individual and group publicity photos and videos are taken from time to time and in consideration for my child(ren)'s participation I hereby grant my permission for my child's likeness to be used in Cheer St. Louis publicity, social media or advertising. 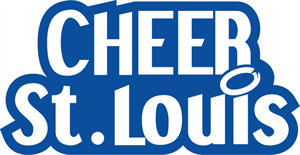 By submitting my credit card information, through the secure, online registration process, I authorize the Cheer St. Louis to automatically charge my card for any and all fees owed to Cheer St. Louis.